We have all experienced that unsettling feeling of trying to find our way through a vast building, such as a hospital. Feeling lost can be overwhelming, and at healthcare facilities, time is of the essence. Every moment someone spends tracking down their destination can be vital, making wayfinding signs essential. According to “Wayfinding Management: Models & Methods in Healthcare Environments,” a 2018 report from the Sign Research Foundation, there are some best practices of how to manage, create, and update your signage to better help your guests in navigating your facilities. When developing proper wayfinding systems, it is important to appoint a wayfinding manager. This manager will supervise all activity involved with wayfinding signage. Depending on the size of the facility, or how many campuses are within your healthcare system, you may also need to create a wayfinding committee. This committee will conduct research, establish guidelines, and ensure that your location is using the best possible wayfinding strategies. Through assigning specific responsibilities involved with your wayfinding plan, each task will be clearly delegated. This proves to be more efficient and helps to avoid confusion as to which jobs have already been completed. Signs themselves serve as valuable wayfinding devices and guide customers through high-traffic areas to their intended destination. According to On-Premise Signs as Storefront Marketing Devices and Systems by Taylor, Claus, and Claus (2005), this is why the federal government has detailed specific guidelines for highway signage. While hospital signage does not face the same, strict regulation that street signage does, the principle still stands. 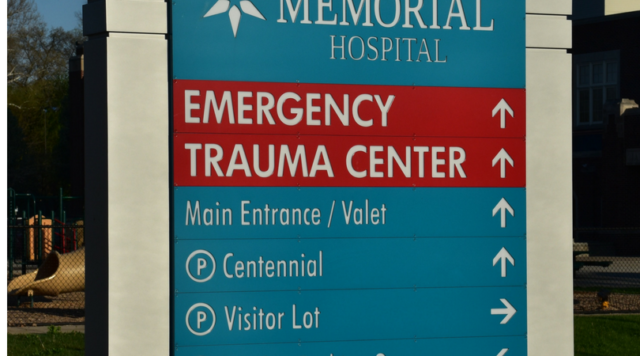 Visitors rely on these signs within a hospital to help them navigate around safely and reach the right destination. Because of this, after choosing a wayfinding manager and/ or committee, standardization among all signage is key. Establishing a consistent vocabulary of building and area names is crucial to the success of the wayfinding system. Additionally, using a consistent room numbering system will help visitors anticipate how far they are from their destination. This will also help visitors gain a better understanding of the layout of the building. There is a great deal to learn from listening to visitors, which is why shaping your strategy to their needs is very important. Regularly developing methods to obtain user feedback is a great way to gauge the current performance of your wayfinding signage. Conducting a survey of recent visitors of the hospital will be extremely valuable in understanding the effectiveness of your signage. While there are many ways of collecting visitor data, even something as simple as observing visitor reactions as they navigate around the hospital can provide valuable insight. You may notice several people mention how lost they were when arriving at an appointment, or you’re stopped by visitors seeking directions several times a day. These are indicators that your current signage could use some improvement. With the rise of smartphone usage, hospitals have the opportunity to implement online applications as part of their strategy. These apps can help visitors develop a custom map of the hospital, showing them only locations they need to find. Boston Children’s Hospital developed a wayfinding app that did just that. In fact, within 6 months they had over 4500 downloads of the app, along with many positive reviews. Using new forms of technology in your wayfinding plan will give your hospital a competitive edge, and ultimately leave visitors, patients, and staff with a more positive experience. This article was posted in Healthcare Industry, Wayfinding and tagged Branding, healthcare, signage, wayfinding, wayfinding signage. Bookmark the permalink. Follow comments with the RSS feed for this post.Post a Comment or leave a trackback: Trackback URL.